I thought it might be interesting to periodically check how the Acumatica groups on LinkedIn compare to some other ERP groups on LinkedIn. I looked up 18 different ERP groups on LinkedIn (including Acumatica) to compare their number of members and number of discussions posted this month in order to gauge how large and how active they are. Now, this is not a very accurate method to try and determine how large the user base is for these ERP products and how active they are, but I think it’s still an interesting thing to track. See graphics below. A large group membership doesn’t necessarily mean that there are a lot of people still using the product as it is likely that many people won’t bother to leave a group after joining it, even if they haven’t used the product for a long time. Acumatica is almost on the bottom, but at least it’s ahead of rival Intacct! 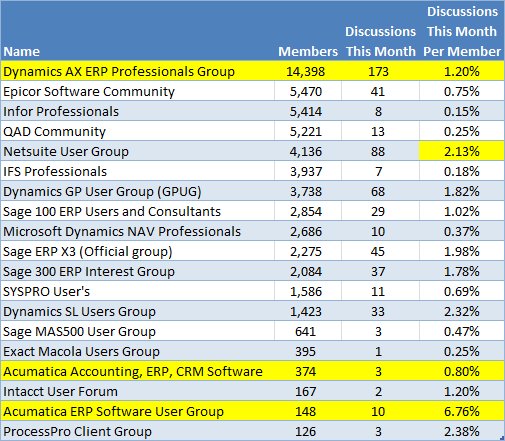 The Acumatica ERP Software User Group had by far the highest number of discussions this month per member. I’ll be putting a link to this post on this group which will make this number even higher. It’s probably a little unfair to include Dynamics AX in this group because it is really a Tier 1 product like SAP and Oracle, but I included it because the other Dynamics ERP products belong in this group. NetSuite has a very active group and a large number of members. Let’s see if Acumatica can gain ground this year.